This vintage real photo postcard features a pretty teenage girl wearing a large hat topped with flowers The postcard is color tinted and published by Furia as part of a series (no. 1786). Furia was a French postcard company. Most of the Furia cards that I have encountered have been greeting postcards. Pure artistic Furia cards, such as the one above, are much harder to find. The message on the reverse of this postcard indicates that it was written in Marseille, France in 1917. On November 11th, 1918, World War I came to an end. It was a joyous time and soldiers and sailors from all the fighting nations were able to return home to their loved ones. This real photo postcard provides a visual image of that time in history. We see two ships speeding home on a a rough ocean. 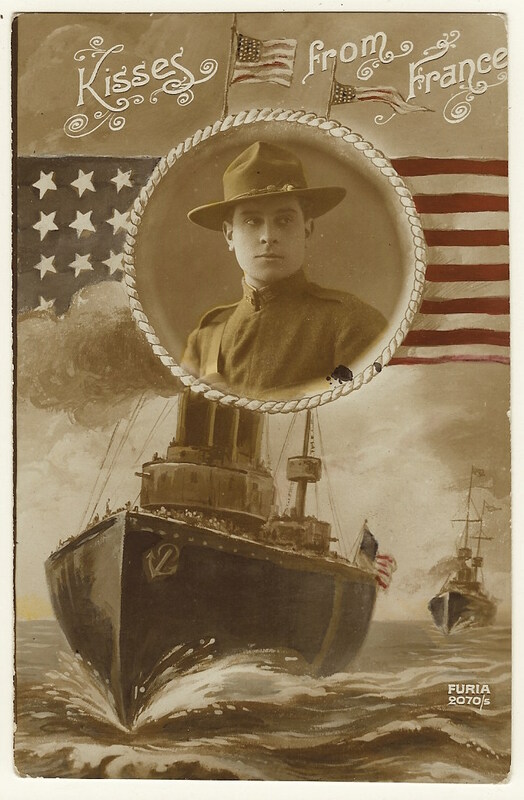 The postcard shows an American soldier who is portrayed as being on one of these ships. Note the American flag in the background as well as the flags on each ship. This was truly a patriotic time. On the reverse of the postcard is a most interesting message. On 12/13/18, about a month after the war’s end, Richard M. Daebelliehn (1889-1964) wrote a message to his wife. I will decipher it the best that I can as it is not totally legible. “Dear Wife, I will wire you just as soon as I hit USA and will have you meet me. You can be expecting a telegram from me”. He signed his name and followed it with an alphabet soup of letters, “HQ (headquarters) M.O.R.S. (?) A. E. F. (American Expeditionary Force) France. It also appears that the word “Cook” appears before his name. 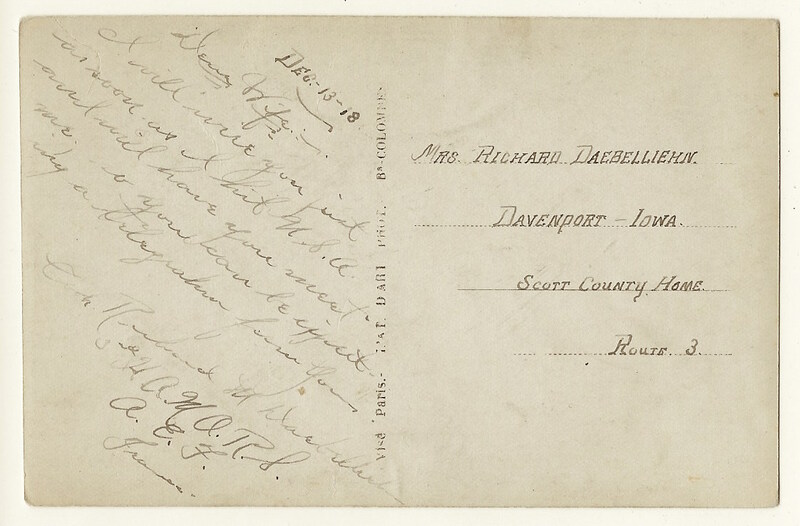 Daebelliehn sent this postcard to his wife who was living in Davenport, Iowa. Research reveals that his wife’s name was Grace Luttsia Anderson. The 1920 US census reports that the couple had two children, Dorothea (age 9), and Robert (age 7). The census, as well as many city directories, indicate that Richard was a butcher (meat cutter) for many years. In fact, he owned his own business. Knowing that Richard was a butcher before the war likely explains why he was a cook in the military. Richard and his family lived in Rock Island, Illinois at the time of the census. I wish I could say that after Richard was reunited with his family that they lived happily together for many years. However, Grace died in September of 1921 in Springfield, Illinois. Richard remarried (Margaret Daebelliehn) sometime before 1930. This postcard was produced by Furia, a French postcard company. The postcard certainly is a relic of history with an image on one side and a story on the other side.